Freewriting is what you write when there’s no one looking. Freewriting is the madman in your brain taking the controls and sending words all the way down to the tips of your fingers. Freewriting is where you’ll find the most brilliant story ideas, if you look hard enough. To freewrite, just write. Write the first word that comes to mind and then follow it with another. Set an alarm if you can. Don’t worry about grammar, structure, character development – just write. And when you’re done, stand back and take a look. Is there anything in there you can use. I’ll say there is! The above freewrite might seem silly but it’s also an example of how freewriting could, potentially, inspire a proper piece of writing. This daft thought about Picasso’s washing up could easily be worked into a comedy radio play where a hung-over Pablo Picasso and Henri Matisse wake up after a night out on the town and dare each other to paint a picture of the mess of washing up in the sink. Thus, the modern art movement is accidentally launched. Another possibility you could take from this freewrite is the concept that something generally considered ugly and in need of repair or attention (washing up) can lead to tremendous artistic inspiration – and this idea could form the kernel of a short story or a poem. Here, chose one of the prompts below and let it lead you into a three minute freewrite. I wish I had said…. It was no use pretending…. This entry was posted on Tuesday, February 21st, 2012 at 21:39	and tagged with brainstorm, freewrite, Hungary, ideas, inspiration, painting, paprika, pink chair, pumpkin and posted in Uncategorized, Writing. You can follow any responses to this entry through the RSS 2.0 feed. Thank you Sue for the reminder about freewriting, and some prompts to get me going. Sometimes I arrogantly think I can write without any kind of exercises or practice to become a better writer, but like any other skill it needs to be worked on – and now I will do some freewriting! I recall freewriting in junior high and high school. I have journals all over the house just for this purpose. The crazy girl in my head just needs an outlet somedays; and I just go with the flow. On days when I can’t think of what to write in my blog posts, I refer back to my journals. Usually, I can find something that helps me craft something usable. I love where your freewriting took you. I haven’t done any freewriting in many years. I’m not sure why I stopped. Thank you for reminding me of this tool. Freewriting seems like a good way to get unnoticed ideas out of your head and down on paper where they can be investigated. I will certainly have to give this a try sometime soon. I love to free write and I believe it’s essential. Thanks for sharing this! What a great painting. 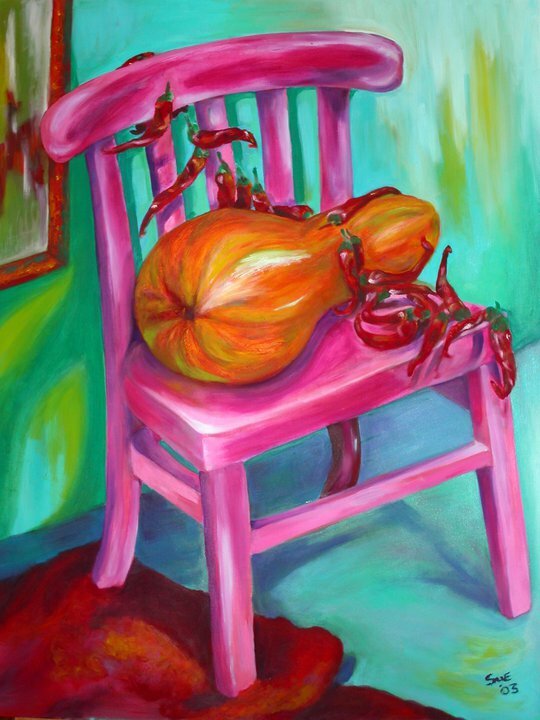 I love the bright colors and the shapes of the chair, peppers and pumpkin. It’s a piece I would love to have hanging on a wall in my home, except my RV really doesn’t have walls. Three minutes was not enough, which was surprising considering I wasn’t even sure if I would get past the first sentence. I generally write non-fiction, but I wove a fanciful idea of the pumpkin into a real-life situation. this was a great, playful exercise. Thank you! Lol..Interesting post..compels the mind to just open up and let words do their magic and string itself into a story.. I went with one of your phrases you could read my free written post alteredtoredefine.blogspot.com..
“What about it?” She was searching for the box of Cascade.